When I first tasted these at a party, I knew I had to have the recipe. One or two of these alongside a cup of strong, honey-sweetened tea makes a perfect afternoon pick-me-up. We have Real Simple magazine to thank for the recipe; Martha Stewart's version is similar. 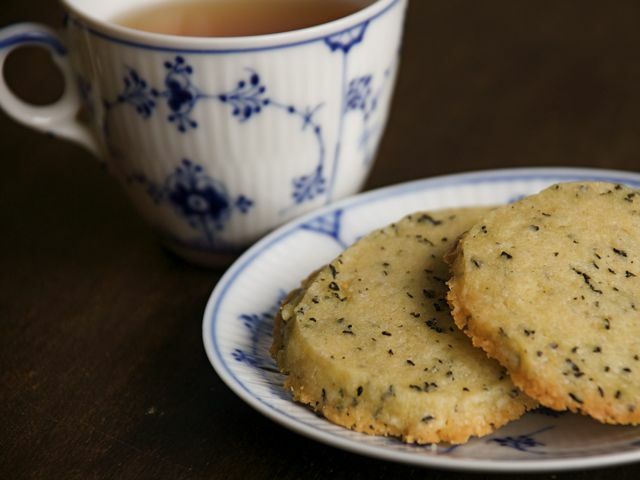 The recipe is a tea-flavored version of the cookies known in French as sablés and in English as sandies. In a food processor, pulse together the dry ingredients until the tea leaves are cut into small bits. Add the vanilla, water, and butter. Pulse together until a dough begins to form. Press the dough into a loose ball, then divide the dough in half. Place each half on a sheet of plastic wrap and roll into a log, about 2 inches in diameter. Wrap tightly and chill for 30 minutes. Slice each log into circles ⅓-inch thick. Place the circles 2 inches apart (they will spread while baking) on baking sheets lined with parchment paper, aluminum foil, or silicone baking mats. Bake until the edges are just brown, about 10 to 12 minutes. Let cool on the sheets for 5 minutes, then transfer to wire racks to finish cooling.